Joensuu is a university town and regional centre in the Lakeland area of Finland. One third of the city’s population is less than 25 years old. We are developing a symmetric city centre which will be the future heart of travel services, living, business and recreation, all located beautifully at the river bank in the very centre of the city. Joensuu aims to be carbon-neutral by 2025! The City of Joensuu has an ambitious climate program that aims the city to be carbon neutral in 2025. The climate program has been implemented since 2010. In order to achieve the goal, Joensuu must reduce its greenhouse gas emissions by at least 60% from the level of 2012. This goal is reached by utilizing several procedures. 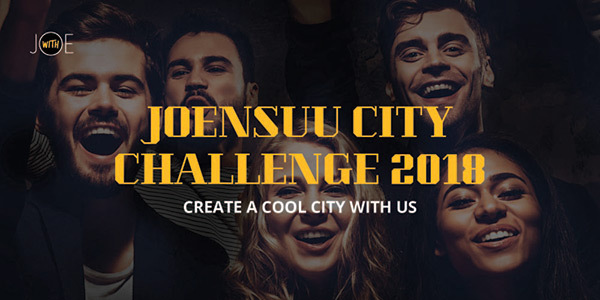 The Joensuu City Challenge is a new competition for cool and inventive ideas for the smart city that can be implemented in the Joensuu city centre. The competition was open to SMEs all around the world. 4 winners have been announced to run pilots to test innovative solutions for city development and improved quality of life for residents.